Candies like SNICKERS® and Starburst® are perfect for the big game. Not only are they great to serve right from the bag, they are also yummy ingredients in recipes like my SNICKERS Puppy Chow. Do you have a party planned for the big game? I like to watch it with friends while enjoying all sorts of football foods. 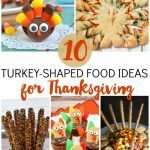 While I love savory finger foods, my favorite is a sweet treat to munch on. Watch out, this puppy chow is addicting! It’s so easy to eat the whole bowl without even realizing it. The first step in making this SNICKERS Puppy Chow is to head to your local Walmart and grab some candy. 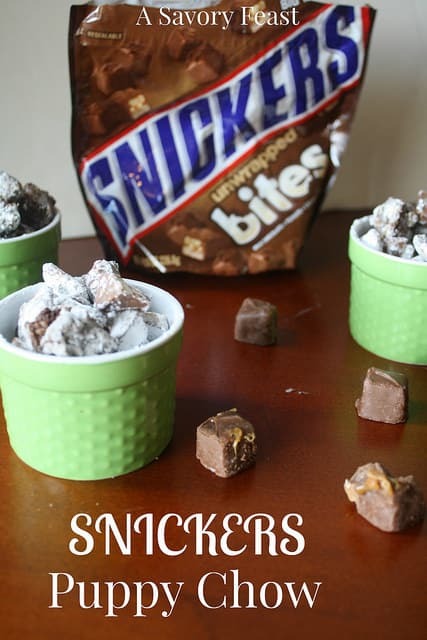 SNICKERS Unwrapped Bites were the perfect thing for this recipe. If you can’t find the Unwrapped version, any variety of SNICKERS will work just fine. I loved saving a step by not having to remove all the wrappers, though. I also grabbed a bag of Starburst while I was there. It’s a super-easy candy to serve during the game. Each piece is individually wrapped, so I don’t have to worry about how long it sits out. 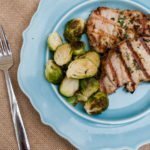 When it comes to getting ready for game day (or any party), I love recipes that can be made ahead of time. Not only is this treat quick and easy to make, you can make it a day or two in advance. Puppy chow is one of my favorite sweet snacks. Adding SNICKERS made it even better! Any chocolate-lover will be head-over-heels for this treat. Most of the puppy chow recipes I found online used peanut butter, but I decided to try something a little different. This recipe uses a hazelnut spread. 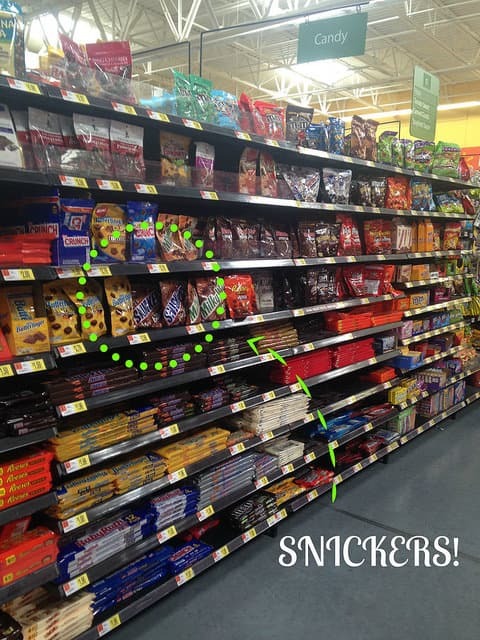 It goes so well with the SNICKERS pieces! In a pan over medium low heat, melt the butter and chocolate chips while stirring. Once the chocolate is melted and smooth, remove from the heat and stir in the hazelnut spread. Pour the cereal in a large mixing bowl. Slowly pour the chocolate mixture over the cereal. Stir until well coated. Pour the cereal mixture into a large ziploc bag. Pour in the SNICKERS and add the powdered sugar 1/2 cup at a time, shaking to coat. What is your favorite treat for the big game? This looks so yummy! We love puppy chow! I love it, too! 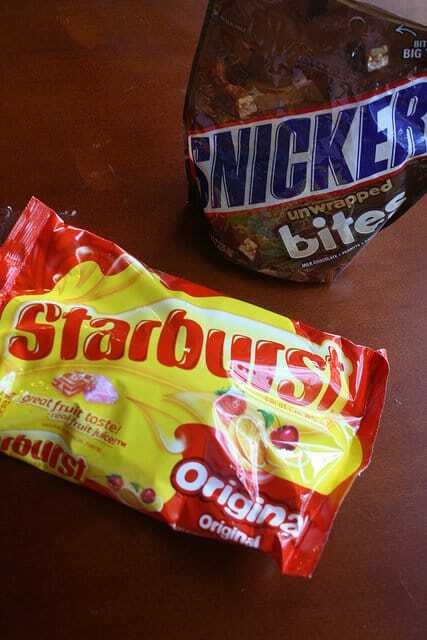 The Snickers were soooo good in it! Oh yummy! We don’t do much for the big game (we don’t have cable so it’s hard to watch on my phone, but we usually do homemade pizza. Homemade pizza would be a fun idea! I’ll have to do that sometime. I love munchies like this for game day. Puppy Chow is so yummy with Snickers! 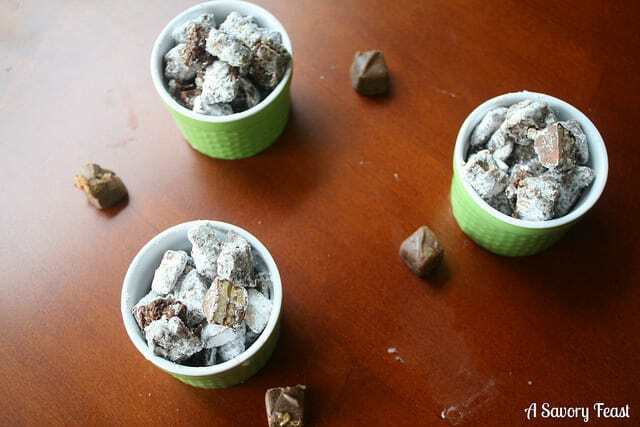 Yum I love making puppy chow, it’s so easy and the perfect snack to just munch on! This would be great for the big game for sure!! It’s bad, I can’t stop eating it! It’s worth it, though. Thank you! 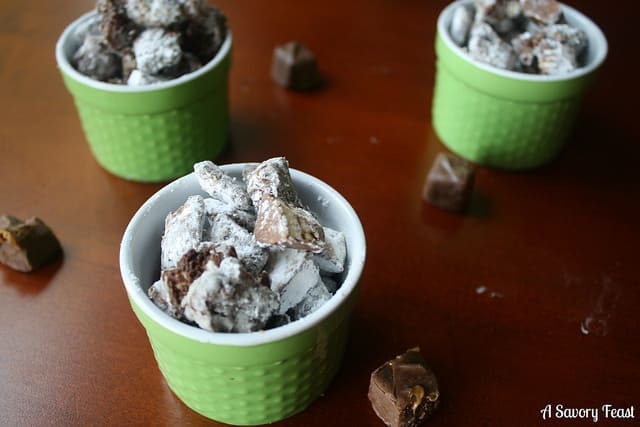 I really liked the combination of Snickers and the classic puppy chow recipe. It was yummy! Yum! This would be perfect for the big game! 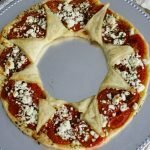 Don’t forget to stop by Totally Terrific Tuesday tonight to share this awesome recipe! It was just the right thing to add a little extra sweetness. It’s addicting! where did u buy these green little pots?? they are beautiful! I’m glad you liked it! It’s really easy to make ahead of time for a party. Watch out, it’s addicting! Snickers is one of my favorite candy bars. They are soooo good in puppy chow! This looks amazing! I’m a big fan of puppy chow. 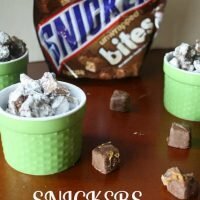 I’ve made several different versions myself, but this Snickers recipe would be a HIT in my house. Pinning this. I love puppy chow, too. There are so many ways you can customize it. 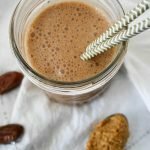 I am a chocolate-on-top-of-chocolate type of person, so the more the better for me! Salty and sweet all in one? You got my tummy growling! We are making a homemade twix bar for the party this Sunday but I may see if any of our other guests need an idea!!!! 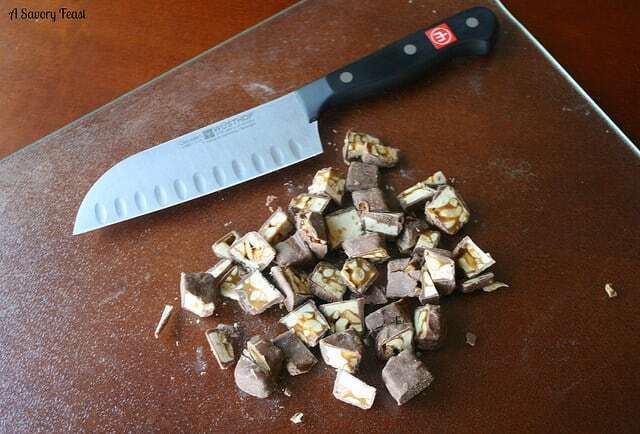 Homemade twix bar? That sounds amazing! Twix is another one of my favorites. This looks so good! I love snickers and puppy chow so put them together and I meet the whole batch! I love eating queso during the game. I’m a salty person all the way! But this might need to be added the line up! I love salty snacks, but the sweet ones are my favorite! I could munch on this puppy chow til it’s gone. This is a dangerous recipe. I love chex cereal and Snicker Bars. Thanks for sharing on Merry Monday! It certainly is dangerous! I’m glad my batch is gone and out of the house. I had way too much! Oh this is going to be so such a dangerous recipe for my household. We love puppy chow and Snickers. Thanks for linking up to the Bloggers Brags Pinterest Party. I have pinned to the Bloggers Brags Board. Thanks for stopping by, and for hosting the party! I’m glad you enjoyed the recipe. Yum! This looks so good! 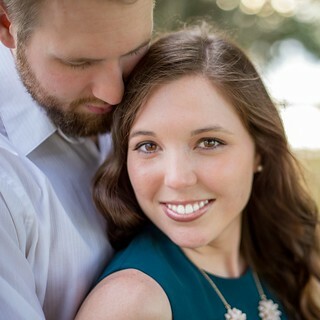 Thank you for linking up at The Wednesday Round Up and we hope to see you back this week! Thanks Emily! I’ll see you at the party.